1 The heids o state leeted here are the first an last tae hauld each teetle ower time. 2 The position o Ministerpräsident wis introduced in 1792 when Proushie wis a Kinrick; the prime meenisters shawn here are the heids o the Proushie republic. 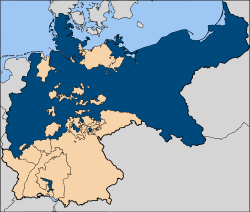 Proushie (German: Preußen (help·info)) (Pols: Prusy) wis a heestoric state oreeginatin oot o the Duchy o Proushie an the Margraviate o Brandenburg, an centred on the region o Proushie. This page wis last eeditit on 5 Apryle 2018, at 23:21.